The registration period for the Biodigital Architecture Official Master will end shortly. Come to Barcelona and see what new architecture looks like. 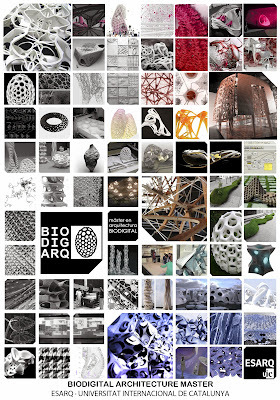 The UIC Master’s Degree Programme in Biodigital Architecture was created in 2000 as a pioneering postgraduate programme, the first that treated architecture from the biological and digital perspectives, and the first to provide systematic studios, workshops and seminars with the founders of digital organism, the new cutting edge of the 21st century. Within the context of the research line on genetic architectures at the ESARQ School of Architecture, students will pay special attention to new cybernetic-digital and new ecologic-environmental architectural design as a way of developing biodigital architecture, emergence, genetic and generative concepts in the biological and digital worlds, biomimesis, biolearning, morphogenesis, etc. Students will also experiment with genetic-driven software, evolutionary processes, emerging systems, algorithms, parametrics, scripting, etc.